The latest numbers have been released for what the top mobile platforms were for August through November of this year by ComScore, and compared to last year, things are looking not so great for a couple of companies. While Google has the most rejoicing to do as 2011 winds down, it’s only Apple that can join them in the festivities. Of the five largest mobile operating systems, these were the only two companies to show any growth. It isn’t the least bit surprising to see Symbian losing some ground as its a dying platform, but RIM lost a significant amount, and with Microsoft making a major push on Windows Phone, it can’t be heartening to see they actually lost half a percentage point. Seeing as Nokia has dumped its own Symbian platform in favor of Windows Phone, there is every chance we could see this trend reverse, but one has to wonder if the Finnish company isn’t beginning to worry a bit that they have made the right choice. As for RIM, with all of their current financial woes it certainly didn’t need any more bad news, and this is certain to not help them out on the stock market. While Apple’s gain was less than half of Google’s, it’s becoming more obvious that the mobile market may really only be a two horse race at this time. Microsoft may still have a shot at becoming a contender, but it has a long way to go, and as people become more vested in a platform by buying apps, it’s going to be harder and harder to get them to change. 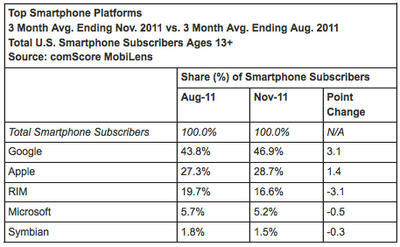 What do you think of the way the mobile market is beginning to shape up?